Peterborough has celebrated World Down’s Syndrome Day 2019 with a spectacular set of images laid out on the turf at Posh’s ABAX stadium. 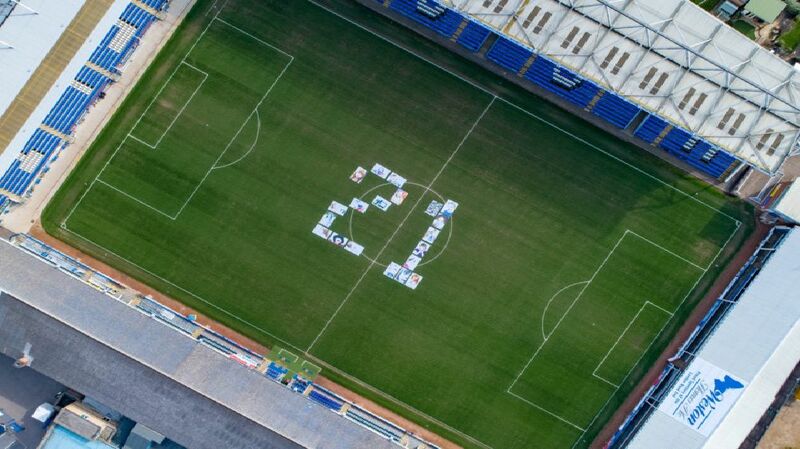 Seen from the air the number 21, created from photographs of people with Down’s Syndrome dominates the centre circle helping raise awareness of Down’s Syndrome. The number 21 signifies the 21st Chromosome which is triplicated in people with Down’s Syndrome. The project was the idea of Terry and Karen Harris, who created the DS - The Big Picture campaign. Karen and Terry have released a number of videos from 16 of the families involved showing the highlights, challenges and reality of living with Down’s syndrome. Titled “Growing Up”, the videos catch up with them six years on. “We wanted to catch up on the families and find out what had happened in the last six years, the good points, the challenges and just to re-connect with everybody,” said Karen. The children in the project include Terry and Karen’s daughter Lucy, aged 11, who also has autism.